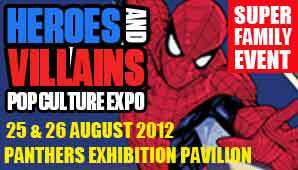 Heroes and Villains Pop Culture & Comic Expo - get your geek on with this event first. 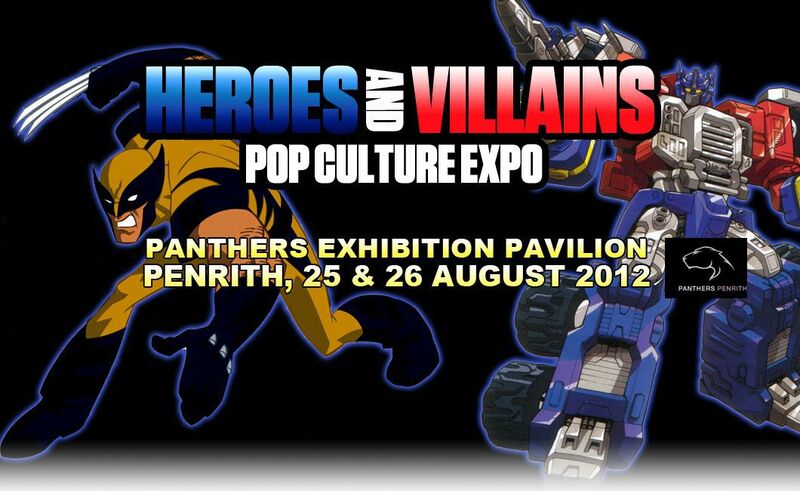 For the first time ever, this event brings together your all time favourite pop culture heroes and villains from numerous genres - sci-fi, horror, fantasy, gaming, anime, animation and TV and film. Heroes or villains, who do you love, who do you hate or love to hate? All your favourites will all be there. This will be more family friendly than the larger expos and will be based in the suburbs, so you don't have the grand expense of travel and parking to the city. 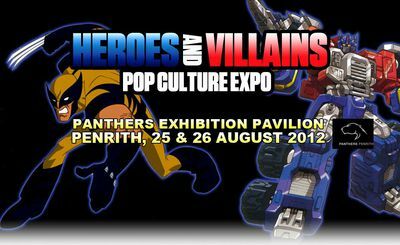 This event is coming to the people at Western Sydney's Penrith Panthers Exhibition Pavilion on 25 & 26 August 2012.
Who is your favourite hero or villain? It has its own car park and is easily reached by trains and buses. 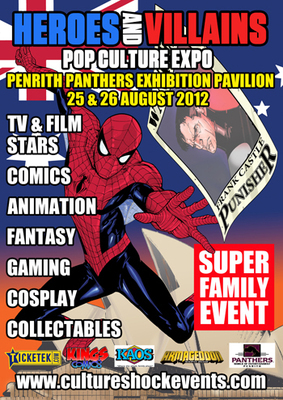 That should save you a few dollars to spend on some merchandise or collectables. There will be a large retail dealers area to pick up great items to add to your secret collection. A perfect opportunity to wear your hero or villain outfit in public - don't worry, you will be in good company and fit right in at the venue or on the way. What a hoot it will be to stop at your local grocery store to pick up a few snacks dressed as Spider-man. 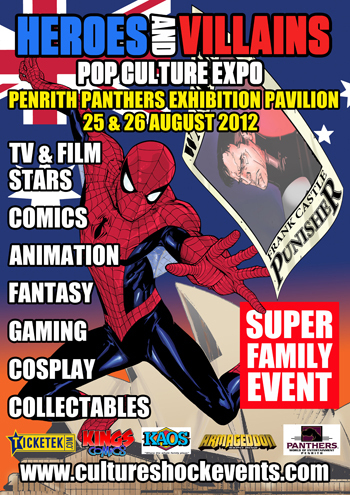 There will be a heaps of fun with gaming in many formats. Plus screenings of upcoming films and TV shows and master classes and workshops. Watch out for the celebrity guests too. Cary Elwes - The Princess Bride, SAW, Robin Hood: Men In Tights, Bernie Koppel - The Love Boat, Get Smart, Thomas Dekker - Secret Circle, Sarah Connor Chronicles, Frazer Hines - Doctor Who, Gary Chalk - Voice of Optimus Prime in Transformers: Armada, Stargate SG1, The Killing, Steve Blum - Voice of Starscream in Transformers: Prime, Woverine in Wolverine and the X-Men and more to be announced. It is expected to be a big event with limited numbers, so don't miss out and pre-purchase your tickets. Available at Culture Shock Events website. - Choice of two (2) single guest photo ops from our media guest line-up. - Express queuing for autographs & photos at celebrity signing area and also at animation signing area. - Single (1) Ticket to the exclusive Heroes and Villains Cocktail Meet and Greet Party. - Special offers if they may arise. *Note: Prices and events may alter and update. So check the above information. Why? To get your geek on in public!